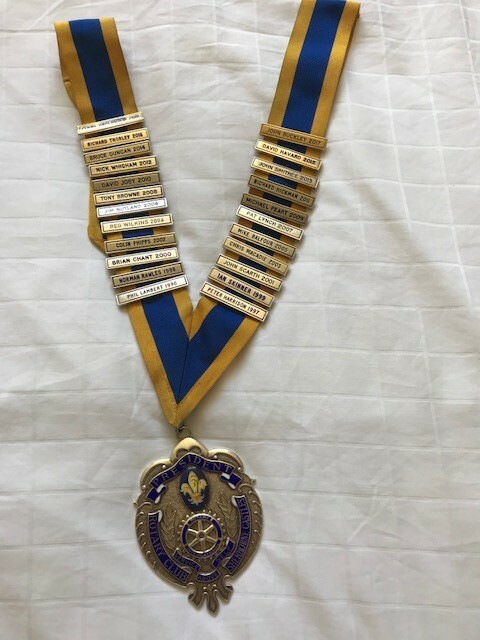 Week 1 – 2nd July 2018 – the beginning of the Rotary year……..
……and the day that I officially became President of the Rotary Club of Sherborne Castles – wow! This is the presidential chain – there have been 22 Presidents before me. That’s a lot of footsteps to follow in. Mmmm…….. blue and yellow……..not really my colours. But I am not planning to wear it much so I have put it away in its box. We are the only Rotary club in Sherborne, there used to be two, now there is just us. Rotary is a huge organisation with 1.2 million members in more than 32,000 Rotary clubs in 200 countries around the world and since it started in 1905 Rotarians have volunteered their skills and abilities to tackle the world’s most pressing humanitarian problems. While having fun and enjoying friendships, we share a commitment to improving lives both locally and internationally. Anyone who shares the Rotary values can be a Rotarian. Our club meets twice a month for Rotary business meetings when we plan our activities and projects. We have other social meetings as well which, in the next couple of months, will involve walking, a BBQ and treasure hunt, a picnic at one of our local village events, and a meeting with a local poet. Many of these activities involve food as some point – Rotarians like food! But my first week as President has been taken up with organising the Classic and Supercar Show at Sherborne Castle next weekend on Sunday 15th July. This is just one of several events which we are organising in Sherborne during the next few months, and this is a big one. We work on this event with two other Rotary Clubs, Brue Valley and Yeo Vale, and this is the 5th year we have run it. Each year it gets better, and this year we have sold all the stand space and advance entries are higher than this time last year. The weather is set to be warm and sunny (just like it is now) and it is going to be a fantastic event. Why do we do this? Well last year we raised over £42,000 for charity most of which was distributed to local charities in our area. So that is our club, and if you want to know more about what we do in Sherborne and beyond, you can follow this blog and find out how my year evolves. You are also welcome to come along and meet us at any of our meetings and you can contact us from our web site . Next Entry Week 2 – Join us at the Classic and Supercar Show!